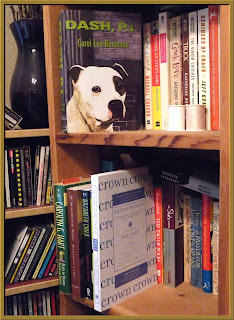 Scene of the Blog Featuring Dixie of Reader of the Pack! Since I love mysteries and I love animals, I suppose it was inevitable that I'd find this week's blogger. Dixie is an archivist in Texas, and she and her husband have given a loving home to seven rescued dogs and cats. If you haven't run across Dixie's blog, Reader of the Pack, while you surf on the Internet, I hope you take this opportunity to correct the "oversight." 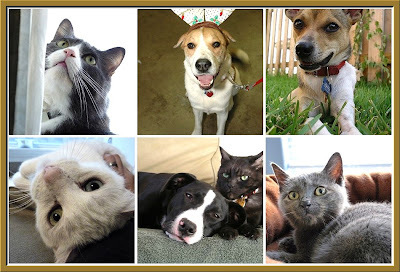 My blog is called Reader of the Pack because I have seven pets - three dogs and four cats. 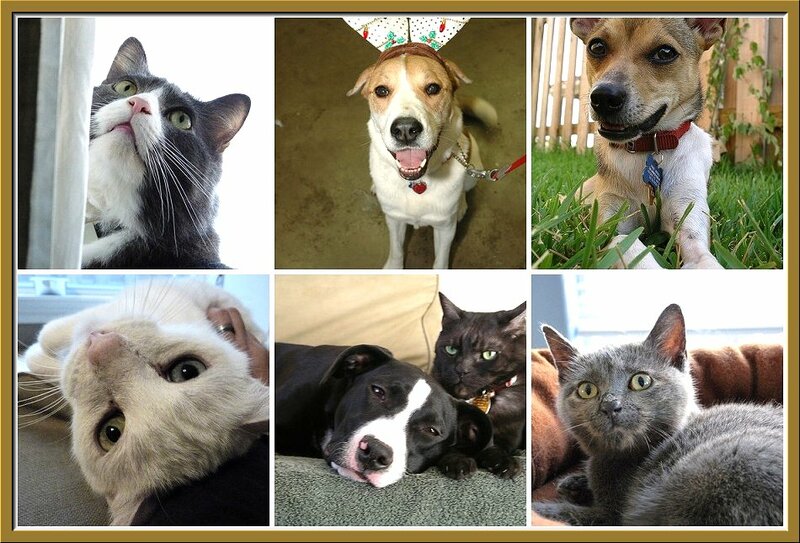 They are all rescued animals and each has a story of its own. I couldn't do Scene of the Blog without sharing the pack with all of you! Sherman in Dixie's living room. Most of my writing for the blog takes place in the living room. My favorite spot is the cozy corner of the sofa. I like to curl up under a blanket and read or write here. (Yes, even when it is 105 degrees outside in Texas. It gets chilly with the air on.) 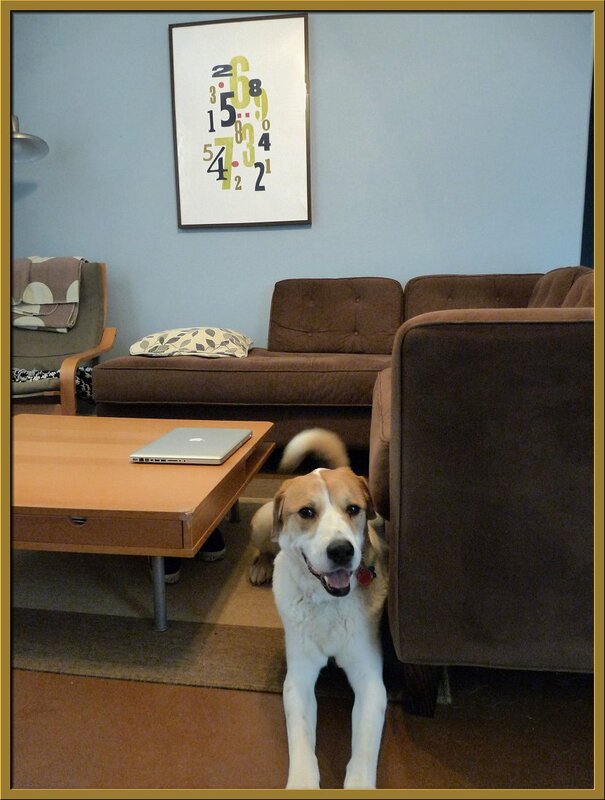 That's Sherman the dog hanging out on the floor. 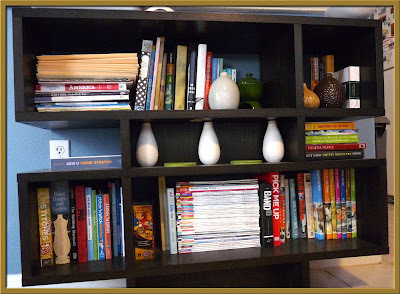 The bookshelves show an eclectic mix of books. I primarily read mystery and crime novels, but I also read fiction, short stories and non-fiction. The bookshelves also include my husband's books, which lean towards graphic novels, design and pop culture books. Usually I read at night before going to sleep, so there must be a good selection on the nightstand. Currently it is covered in library books and my trusty nook sidekick. I am a big fan of NetGalley and eBook lending through Texas libraries. I have my fingers crossed that someday my local Austin library will offer eBook lending. Dixie, I'll have you know that I can no longer hear that oldie but goodie without singing, "the READER of the pack!" 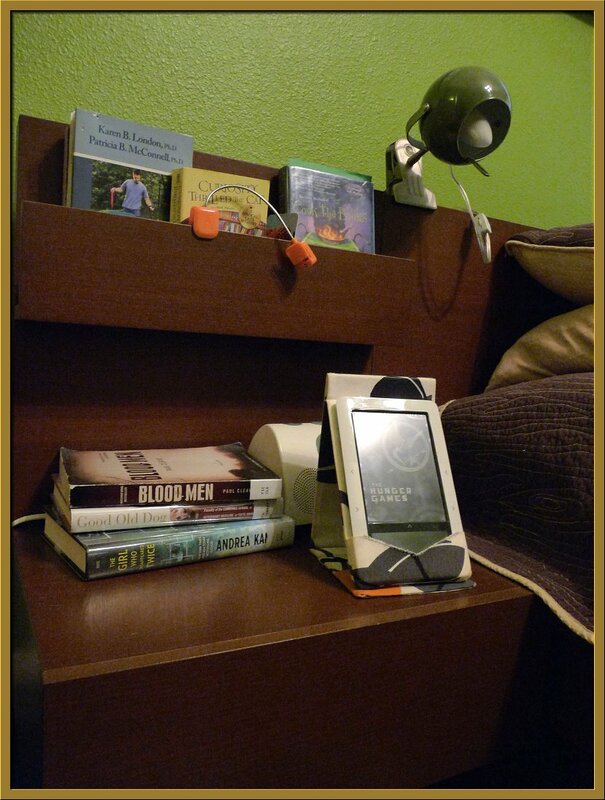 I love your pack, and while your Nook sidekick reminds me of my husband's Nook, your shelves remind me of... me. Thank you so much for sharing your creative spaces (and buddies) with us! 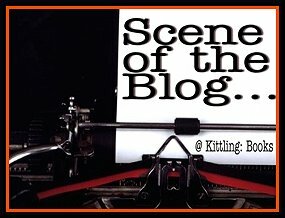 Don't forget to stop by next Wednesday when another book blogger from our worldwide community will share his or her favorite spaces with us on Scene of the Blog! Very clever blog name and appropriate as well. I like the upsidedown cat, and the others too. How in the world does Dixie keep everything so neat and clean with all those animals? I have a friend in Austin so I know the drought and heat have been difficult for everyone, but Dixie's life sounds like fun. I love the title of your blog, very clever. That cozy reading corner on the couch looks very inviting. I loved the pictures of the pack, I only have two pets, a dog and a cat. So nice meeting you and the pack today. Reader of the Pack sounds like the perfect name for Dixie's blog. The dog in the upper right hand corner reminds me of our little Milou in her younger days. I'm going to check out Dixie's blog now. Thank you so much for the awesome feature, Cathy! And thanks to everyone for stopping by! Barbara - I actually took these photos before I vacuumed and had to crop the bottom off of one photo due to some hair tumbleweeds that had accumulated under the shelves! Also, we have no carpet. It would not be pleasant if we had carpet. Gigi Ann - Two pets sounds so much less chaotic than my life! We have slowly added our pets over the years. The black cat, Basil, is 17 now and he's been with me since he was a kitten. Rae - Thanks so much for the kind words! bermudaonion - That photo of Neko is actually an older photo. (She's put on a few pounds since then. Shhhhh.) If Milou is the dog in your avatar, they do look similar! I love the photos of all the puppies and kitties! We have a plethora of animals over here as well. I also really love your working space and your shelves. So neat and tidy! Thanks to Dixie for sharing her space and her pets with us. Gret blog, Dixie! I love that your animals are all rescues since my cats are all rescues! Great blog name, too! Your couch looks very comfortable...I think I'd be asleep soon after sitting down to read! Reader of the Pack. Love that blog name. Love this post. I'm a follower of Dixie's blog and it's fun to see her reading spaces and pictures of the pack behind Reader of the Pack. I like this feature and will be sure to come back and visit! Readingdate-- I'm so glad you like this feature. I'm looking forward to many more visits from you! Alex - I love my nightstand-bed-attachment! Zibilee - Nice to meet a fellow animal lover! Cathy - This year has been pretty awful weather-wise in the southwest, hasn't it? At this point, I consider 99 a cool front. Leslie, Lori, Yvette, readingdate - Thank you for the kind words!